Mila Stole My Heart: Want a stuffed toy? Here’s Zoorrific Christmas for all! Want a stuffed toy? Here’s Zoorrific Christmas for all! 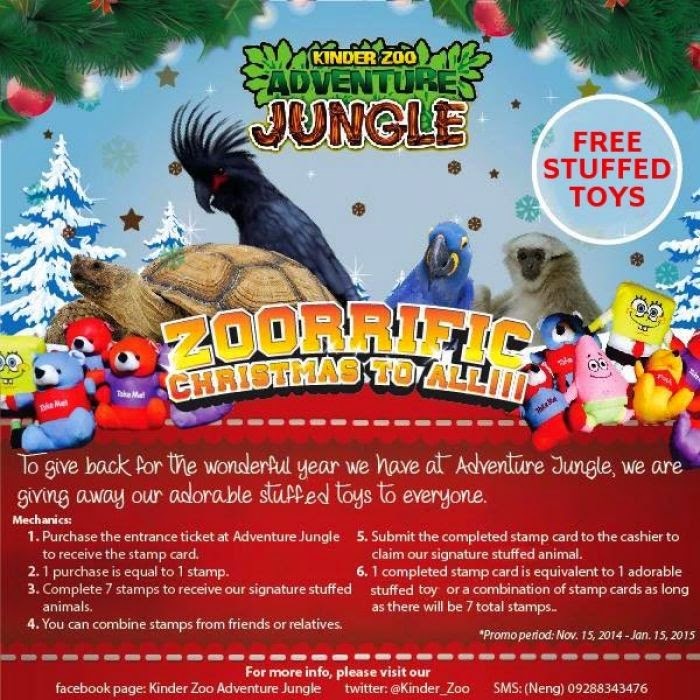 To give back for the wonderful year we have at Adventure Jungle we are giving away our adorable stuffed toys to everyone. 1. Purchase the entrance ticket at Adventure Jungle to receive the stamp card. 2. 1 purchase is equal to 1 stamp. 3. Complete 7 stamps to receive our signature stuffed animals. 4. You can combine stamps from friends or relatives. 5. Submit the completed stamp card to the cashier to claim our signature stuffed animal. 6. 1 completed stamp card is equivalent to 1 adorable stuffed toy or a combination of stamp card as long as there will be 7 total stamps.